As promised last week, today I’m going to share with you some of the behind the scenes data from the Foggy Frog and the Pain Gang Kickstarter campaign. By sharing this information I’m hoping to help others who may be interested in running their own campaign and to thank those who had a big impact on the success of the Foggy Frog campaign. After having searched unsuccessfully for children’s books related to Fibromyalgia, ME/cfs and Pelvic Congestions Syndrome, and recieved such positive feedback on my Foggy Frog and the Pain Gang poetry and short stories, I realised there was an opportunity for these characters to fill the gap that I’d found. I spent a few months refining the Foggy Frog and the Pain Gang story and began discussing the possibility of turning it into a picture book with some of my fellow bloggers and Twitter friends. Once deciding to make the book, I researched the costs associated and realised I couldn’t afford to do this by myself, thus the decision to crowd fund the project and make this a campaign by the community for the community. I spent a few months working on the Kickstarter campaign page and building up a group of dedicated supporters and on Sunday, 2 March 2014, the Foggy Frog and the Pain Gang Kickstarter campaign was launched! 27 days later we had successfully raised $7,529 to get the first run of the Foggy Frog and the Pain Gang picture book published and distributed around the world! As can be seen in the Funding progress graph above, we recieved 30% of our target within the first 7 days and just over 41% in the last 2 days! Using Kicktraq to monitor our statistics it was possible to see a breakdown of pledges, backers, and comments on the main page per day. These graphs show that we had an average of 4 backers per day, pledging an average of $269 per day, however their was an obvious increase in the number of backers during the first week and an increase in the amount being pledged during the last few days. Not many people commented on the campaign and the majority of comments were during the last few days. Using bitly.com I was able to track how many people accessed the page and where these people were coming from. Overall, 840 people have viewed the campaign page, this includes the previews I gave to the rest of my support team (15 views total) and the people who have viewed the page since the campaign closed (28 views total). The majority of these views came from Facebook (320 views total), unknown sources such as direct emails, or typing in the address (238 views total), and Twitter (205 views total). 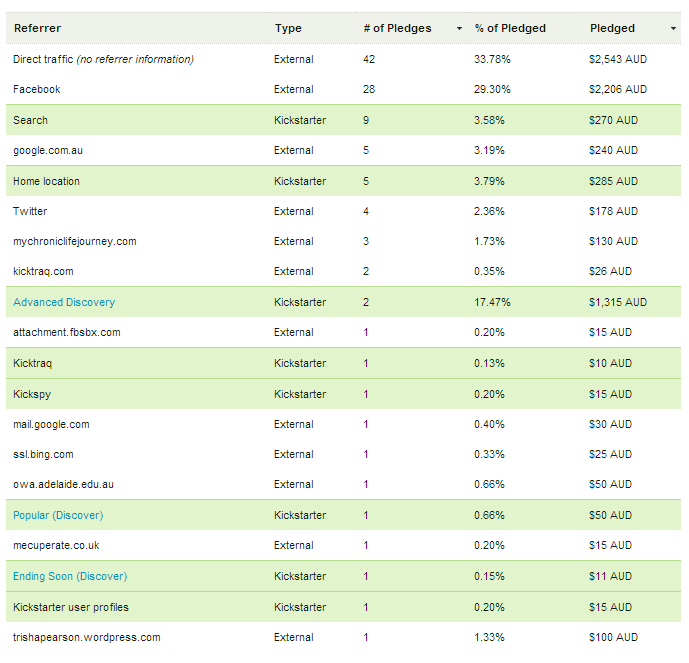 Kickstarter provides project creators with a unique dashboard where they can see specific data on those that back their campaigns. Of all of those who viewed the site, 550 watched the video with 56.73% of them watching it through to the end. Officially the campaign had 111 backers, however once you include those who gave me cash that was added through my family members we actually had 115 backers. As can be seen from the chart and table above, the majority of backers came to the site directly from emails or typing in the address or through Facebook. However, I must note that the dashboard isn’t completely accurate as some people may come through a particular route (e.g. Facebook) but then have a look around the Kickstarter site before returning to the campaign page and donating. These people would have been recorded as coming through one of the Kickstarter routes shown in green in the table above. Two thirds of the backers were people I knew in person, with a third being strangers or people I only knew a little through the internet. 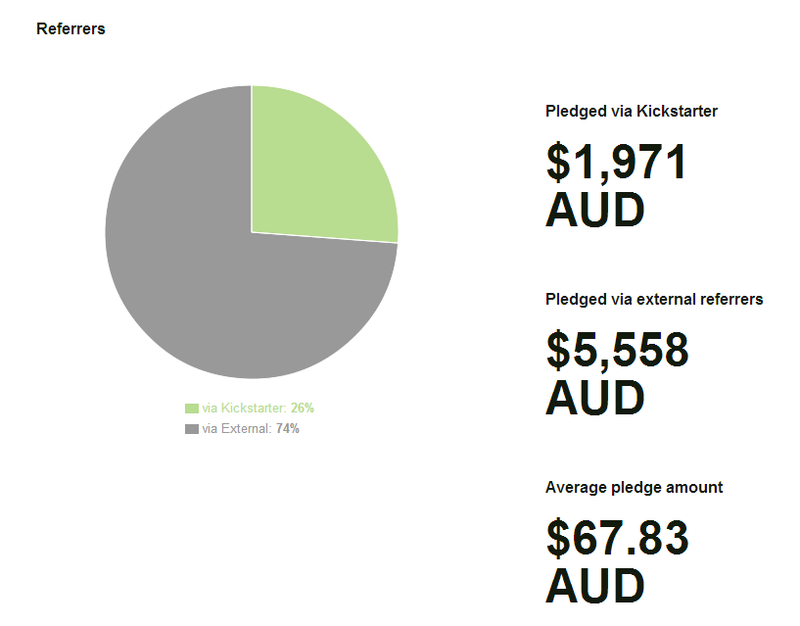 It’s also interesting to note that the average pledge amount was $67.83. I’d like to take this opportunity to thank all of those who wrote articles about the campaign, you can check these articles out in the Media Room. Each of you brought traffic through to the site and helped to raise awareness of this important campaign. The Foggy Frog and the Pain Gang Kickstarter campaign started with 7 and ended with 9 reward levels. Only one of these reward levels recieved no backers ($90 level). As can be seen in the graph above, the $25 reward level was the most popular. This was the level at which people got a physical copy of the book as part of the reward. It also included everything from the levels below it. Surprisingly, the second most popular level was No Reward, closely followed by the $15 reward level. The $100 reward level proved to be the one that produced the most money for the campaign with 27% of the money raised coming from the $100 reward level. The Foggy Frog and the Pain Gang Kickstarter campaign may be over in terms of raising the necessary money, but for me the hardest part is just beginning. Thank you to each and every one of the 115 people who have shown their support for me by pledging money towards the campaign, and to those of you who were unable to pledge money but helped by spreading the word through Facebook and Twitter. Without all of you we would not be where we are today. I am now working on the illustrations for the book and will then be getting revised quotes for publishing and printing this unique and much needed book. Those of you who are backers of the campaign will continue to recieve regular updates from me which will include illustrations as they are completed. I will also keep the rest of you updated with occassional posts here on my blog about where we are at and how you can get involved if you wanted to. I’m hoping this post will be a help to those of you who are currently undertaking your own fund raising or who are considering to do so in the future. Please check out the following projects if you are interested in supporting more material like Foggy Frog and the Pain Gang to get published and available to the world. 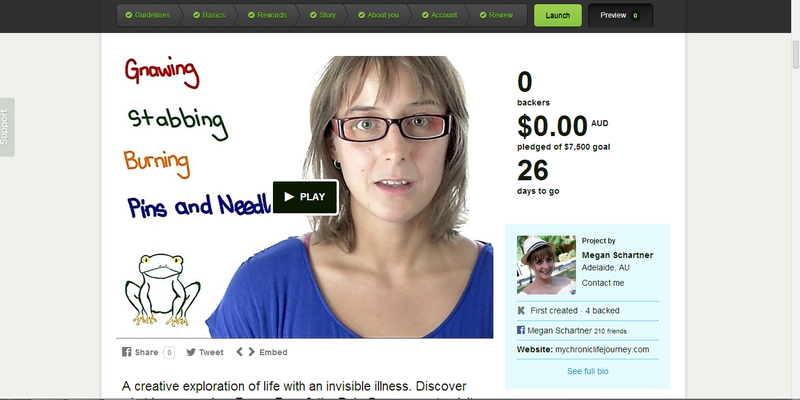 My Invisible Life – a crowd funding campaign to provide funds for the ongoing maintenance of a wonderful story sharing website for those with invisible illnesses. Why Mommy Hurts – a wonderful picture book for young children who have a parent suffering from Fibromyalgia or other Chronic Pain conditions. I’d love to hear about your experiences with crowd funding or other fundraising activities. How would you promote the Foggy Frog and the Pain Gang picture book to the community? Why do you believe stories like this need to be shared?